Great article in the NYT, with lots of information and data analyzing DWB Traffic Stops, and steps some communities are taking to change. Hit the link below and go over and read it! 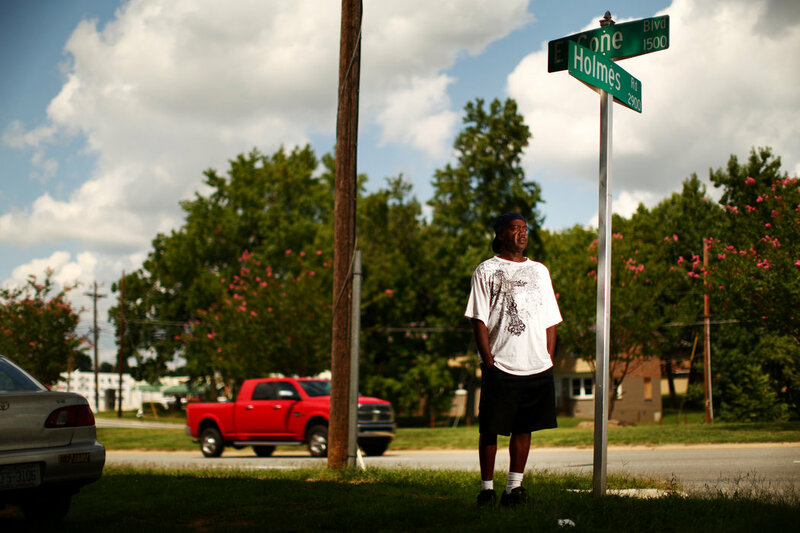 GREENSBORO, N.C. — Rufus Scales, 26 and black, was driving his younger brother Devin to his hair-cutting class in this genteel, leafy city when they heard the siren’s whoop and saw the blue light in the rearview mirror of their black pickup. Two police officers pulled them over for minor infractions that included expired plates and failing to hang a flag from a load of scrap metal in the pickup’s bed. But what happened next was nothing like a routine traffic stop. Uncertain whether to get out of the car, Rufus Scales said, he reached to restrain his brother from opening the door. A black officer stunned him with a Taser, he said, and a white officer yanked him from the driver’s seat. Temporarily paralyzed by the shock, he said, he fell face down, and the officer dragged him across the asphalt. Rufus Scales emerged from the encounter with four traffic tickets; a charge of assaulting an officer, later dismissed; a chipped tooth; and a split upper lip that required five stitches. That was May 2013. Today, his brother Devin does not leave home without first pocketing a hand-held video camera and a business card with a toll-free number for legal help. Rufus Scales instinctively turns away if a police car approaches. “Whenever one of them is near, I don’t feel comfortable. I don’t feel safe,” he said. As most of America now knows, those pervasive doubts about the police mirror those of millions of other African-Americans. More than a year of turmoil over the deaths of unarmed blacks after encounters with the police in Ferguson, Mo., in Baltimore and elsewhere has sparked a national debate over how much racial bias skews law enforcement behavior, even subconsciously. Documenting racial profiling in police work is devilishly difficult, because a multitude of factors — including elevated violent crime rates in many black neighborhoods — makes it hard to tease out evidence of bias from other influences. But an analysis by The New York Times of tens of thousands of traffic stops and years of arrest data in this racially mixed city of 280,000 uncovered wide racial differences in measure after measure of police conduct. Those same disparities were found across North Carolina, the state that collects the most detailed data on traffic stops. And at least some of them showed up in the six other states that collect comprehensive traffic-stop statistics. Here in North Carolina’s third-largest city, officers pulled over African-American drivers for traffic violations at a rate far out of proportion with their share of the local driving population. They used their discretion to search black drivers or their cars more than twice as often as white motorists — even though they found drugs and weapons significantly more often when the driver was white. Officers were more likely to stop black drivers for no discernible reason. And they were more likely to use force if the driver was black, even when they did not encounter physical resistance. The routine nature of the stops belies their importance. As the public’s most common encounter with law enforcement, they largely shape perceptions of the police. Indeed, complaints about traffic-law enforcement are at the root of many accusations that some police departments engage in racial profiling. Since Ferguson erupted in protests in August last year, three of the deaths of African-Americans that have roiled the nation occurred after drivers were pulled over for minor traffic infractions: a broken brake light, a missing front license plate and failure to signal a lane change. Yet traffic codes are so minutely drawn that virtually every driver will break some rule within a few blocks, experts say. “The traffic code is the best friend of the police officer,” said David A. Harris, a University of Pittsburgh law professor who studies police behavior and search-and-seizure law. When a Greensboro officer pulled over Keith Maryland and Jasmine McRae, who are black, in Mr. Maryland’s burgundy Nissan early one evening in March, even that vast authority was exceeded, claimed Mr. Maryland’s lawyer, Graham Holt. In an interview, Mr. Maryland said Officer Christopher Cline had told him that his registration had expired, although it was clearly valid for 15 more days. The officer then said Ms. McRae, sitting in the back seat, “looked like someone” and asked to search her purse. Officers do not have to tell drivers or their passengers that they have the right to refuse, and like the vast majority of people, Ms. McRae agreed. The officer found a small amount of marijuana and several grams of cocaine and arrested her. Mr. Holt said the stop was illegal because there was no traffic infraction. And in fact, a police corporal summoned Mr. Maryland to the station the next day and scrawled VOID across the ticket for an expired registration.